A few blogs entries below, Ranjani dealt with the fascinating subject of Why? - the ever questioning nature of children regarding happenings around them. I am going to deal with a book with similar theme - but, from a different perspective. What if there are fishes instead of leaves on the trees. Each illustration is surrealistic and depicts the what if concept in a stylish and elegant manner. It is a very simple book with a powerful concept behind it. 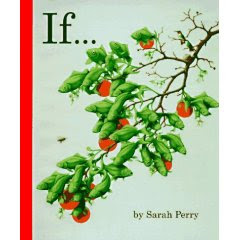 Some of the ifs might make a few adults say 'yuck'!, but, children would love them. For example, one of the ifs is 'if mice were hair...' and it showed a very realistic painting of a small girl who had mice on her head instead of hair. Ranjani found it very yucky, but, Sooraj had a great laugh. Similarly, I felt a bit irritated when I saw the illustration of 'if toes were teeth'. But, children would love to see such wonderful and realistic portrayal of odd things. If you had noticed, I had used the term surrealistic to describe the illustrations and later used the term realistic. But, the truth is that the illustrations are both surrealistic and realistic at the same time. As kids grow up - the society, parents and friends mould them and slowly we make them a replica of ourselves by imposing our own ideas in a subtle manner. A book like this would act as a deterrent to the relentless moulding that the whole society works on without its own knowledge. It helps them to explore a world where things can be different and probably make them realise that there is nothing wrong in thinking/acting differently . Very intriguing. I hav to admit though that the idea behind some of the ifs did put me off, but I am still intrigued to give this a try. Will come back and write in how the reception was with my son! So, true, Satish. You said it so well in your last paragraph. The book shows a picture of a warthog wearing a tiara and looking regal with the words If ugly were beautiful... She clearly did not find the warthog ugly at all, plus, she wondered why beautiful suggests we get to wear a tiara: does wearing a tiara make us beautiful or does being beautiful entitles us to wear a tiara? That's the strength of this book - it allows for a lot of discussions without steering our minds in a specific direction while sparking the natural creativity in kids. Some suppositions trigger giggles, while others make us question our version of reality. My jaded adult mind managed to find a few things rather queasy, thanks to years of conditioning, but, on the positive side, this book has opened up a whole new area of exploration for us via imagining the bizarre and discussing the possibilities and consequences of such impossibilities.